The Joliet Subdivision was originally built by the Alton & Sangamon Railroad between Alton and Springfield in 1851. During the next decade, the line was extended to Joliet, and renamed the St. Louis, Chicago & Alton Railroad. The railroad was later renamed Chicago & Alton. In the mid 1860s, the C&A leased, then eventually bought the line from Joliet to Chicago from the Joliet & Chicago Railroad, The C&A was purchased by the B&O in 1931 as B&M renamed it the Alton Railroad. In the mid 1940s, the B&O let go of the Alton, and after that, in 1947, the Alton was merged into the GM&O. In 1972, the GM&O merged with the Illinois Central to become the Illinois Central Gulf. 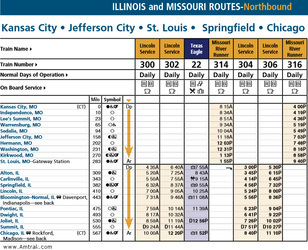 The ICG purged many routes from their system, and the Joliet District as it was called back then, was sold to the Chicago, Missouri and Western (CMNW) in 1987, but the portion north of Joliet was retained by the ICG. The CMNW, while having a very attractive paint scheme, was not a successful operation. Within a year of it forming, it went bankrupt. The line was sold at a bankruptcy sale to Southern Pacific. In 1995, the SP was taken over by the Union Pacific, and in 1998, CN took over the Illinois Central. Currently, the line is owned by the CN from Chicago to Jackson Street in Joliet. The UP owns the line from there all the way down to St. Louis. As has always been the case, the Joliet Sub is a very important passenger route. 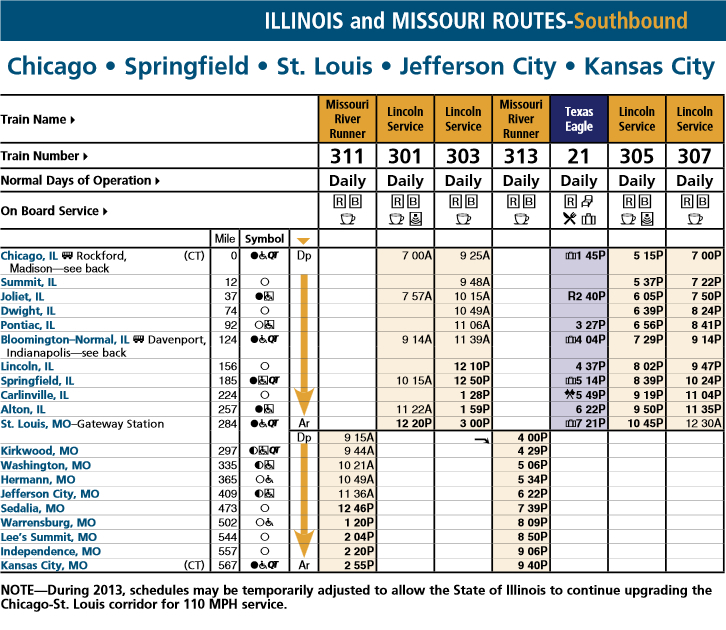 Amtrak currently runs 10 trains a day, 8 Lincoln Service (300-307) and the Texas Eagle (21 and 22). A huge deal that has come to the Joliet Sub is high speed rail. Currently, Lincoln Service trains can do 110 MPH between Dwight and Joliet. The plan is to have the line good for 110 MPH all the way from Chicago to St. Louis. 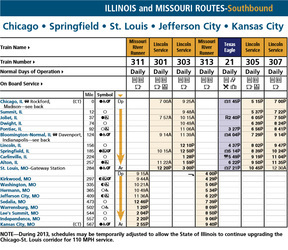 However, this will cause Amtrak to no longer use the Joliet Sub north of Joliet. 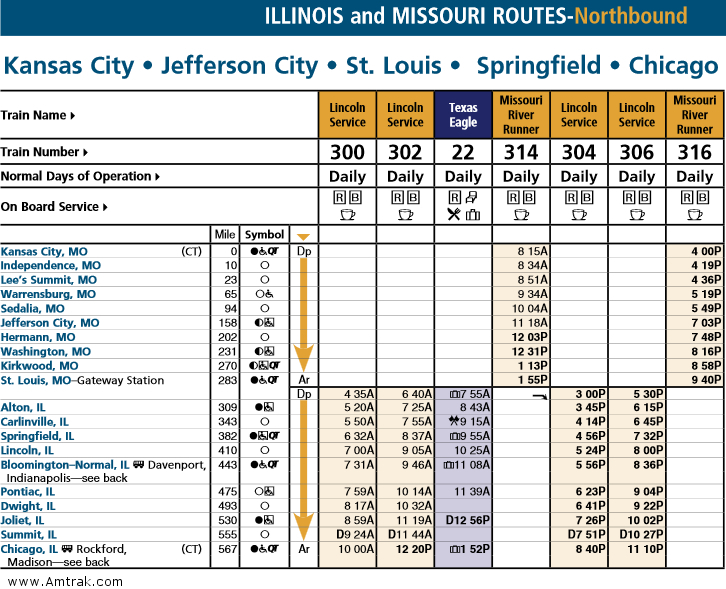 The current plan calls for using the Rock Island between Joliet and Chicago. 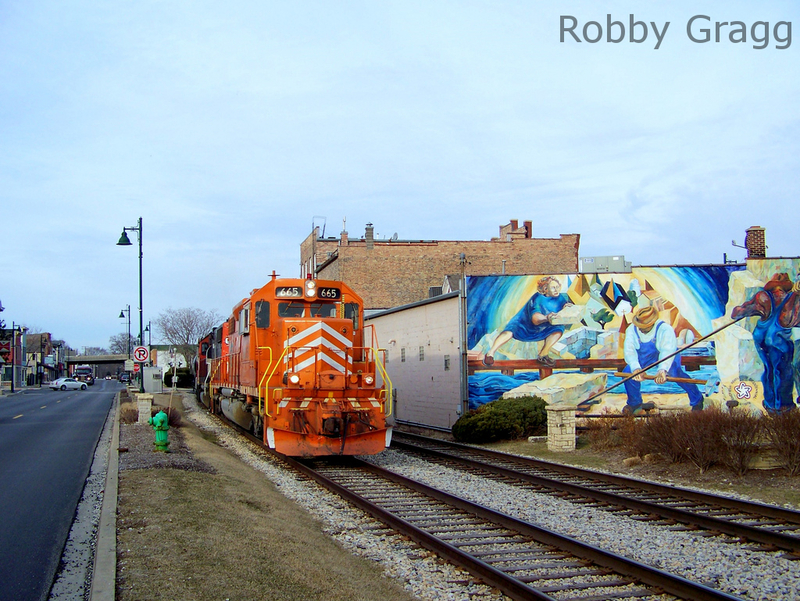 Metra runs six heritage corridor trains on weekdays only between Chicago and Joliet. There are three inbounds during the morning rush, and three outbounds during the evening rush. This is a service that was inherited from the GM&O, which called the one train they ran each way "The plug". 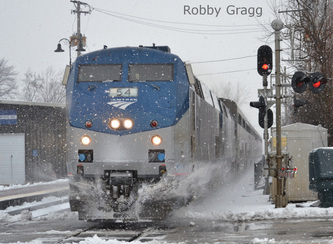 Metra, Will County, Cook county, as well as the cites of Summit, Lemont, Romeoville, Lockport and Joliet, are currently looking to add more train service to the Heritage corridor. So far, the CN has not cooperated with these parties, so service remains at six a day for now. As for freight traffic, the heyday for freight traffic on this line was in the Alton and GM&O days. Regular manifest traffic ran the line up until the UP purchased the SP, in which UP routed the trains elsewhere. 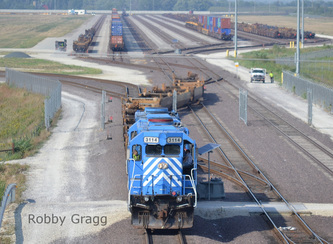 After that, the only freight traffic on the Joliet Sub was MBNAS and MASBN, the Bloomington to Gateway Yard trains. UP also runs a local between Bloomington that works up to Dwight, and sometimes all the way up to Joliet. On the CN side, CN runs a local from Glenn Yard in Chicago to the chemical refinaries of Millsdale, just south of Joliet. 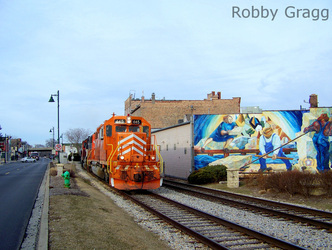 This train gets on the BNSF Chillicothe Sub at Joliet and uses trackage rights to Millsdale. However, a rebirth of freight traffic on the GM&O is occuring. In 2010, UP opened their new Global 4 yard in Joliet, just south of town near the Chicagoland speedway. As a result of this yard, UP now runs several intermodals both ways out of Global 4. Traffic has been steadily increasing as UP routes more trains to Global 4. With Global 4 still growing, the Joliet Sub may reach the amount of traffic it did in its heyday again. This route has several trains as previously mentioned. See the time tables below for more information, and visit the Amtrak.com link at the bottom of the page. As listed above, there are many Amtrak serviced stations, below are pictures of each.